Many people when they are starting out a blog or web site are completely frozen by the "SEO" aspects of their site. Which words should I have in the title? What kind of keyword density should I have on the page? Which keywords should I target? What keywords should I look to have as my anchor text in my inbound text links? Google said it best, and it's totally true; focus on creating a web site that people will like and will use, and the rest will fall into place. 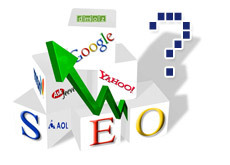 The worst thing that you can do when starting up a web site is to dwell too much on the SEO aspects of the site. Create a site that is easy to navigate, is well-labeled and is stocked with unique and useful content. Don't worry about the anchor text in your inbound links; it doesn't matter. Google will punish you anyways if you over-optimize for a certain phrase. Natural is better. If sites like your content and want to link to you, then that's great. Keyword density? Give me a break. Write articles like you were writing them to a friend. Don't write articles for a benefit of a search engine robot. Accurately convey the meaning of each page in the title of the page, but don't go overboard trying to stuff keywords in. Google just doesn't like that sort of stuff. If you are building for the long-term, then you don't need to worry about it. All you need to do is write extraordinary content, make sure that a human can easily navigate your site, and you will receive unlimited "SEO" benefits in the long run, because your site was created naturally and with the thought in mind that you are creating a great experience for your user. Cater to the user instead of the search engine robot and everything else will fall into place.